This document from the archives of Inside the Auburn Tigers is no longer maintained. Links may no longer function. Images may no longer be available. Editor's Note: This article is reprinted from the September 1996 issue of Inside the Auburn Tigers magazine. In over a century of football, Auburn University has produced a multitude of heroes on offense, large and small. One of the smallest Tigers ever, Lionel James holds a huge place in the memory of the Auburn people, as much for his courageous heart and character as for his exploits on the field. James was born and grew up in Albany, Ga., just a few hours from Auburn, as a fan of the Georgia Bulldogs. He was nicknamed "Little Train" early on, thanks to his size, his namesake in the Lionel electric train company-and his determination to succeed as an athlete. Cherrine James, like many mothers, did not want her son to play football for fear of injury. Lionel's older brother, Edgar, had been hit by a car and severely injured as a child, and James himself, eerily, was also run over years later, at age eight. (Edgar recovered and is now an FBI agent.) The ligaments in Lionel's left knee were badly damaged, and contributed to shortening the length of that leg as he grew. Like the little engine that could, James persevered. He started out as a trumpet player in the junior high school band, acceding to his mother's wishes, and, at first, hated it. "That old trumpet case was about as big as me," he says today. He went on to develop a deep love of music, and still plays the trumpet, but was not satisfied. James finally convinced his father to let him play football in the ninth grade. In his own words, James was "the worst player in history. I was like Charlie Brown-if a pass came to me in the end zone with nobody around me, I'd drop it every time." He was told-not for the last time-that he was too small to move on to the next level, high school ball, but by now James had heard enough about his size. "I used it as motivation," he says. "I wanted to prove that person wrong. The thing was, it seemed like everybody was that person." Despite his diminutive stature, James became a successful running back and receiver at Dougherty High School in Albany, playing under Luther Welch, whom James calls "the toughest coach in the world." James says he believes he would have gone unnoticed by the Division I colleges if not for the high level of competition Dougherty faced his senior year. In talent-rich south Georgia, James played "the best three games of my life" his senior season against Tift County, Lowndes County and superpower Valdosta-all in front of college scouts. AU assistant coach Alex Gibbs came to see players like John Lastinger and John Bond (who would eventually quarterback Georgia and Mississippi State, respectively), but remembered the tough little running back from Albany. Auburn was the only major school to offer James a scholarship to become a member of a particularly unheralded recruiting class. After the success of another undersized rusher, James Brooks, Auburn was looking for a small running back. In James' words, "Their first pick didn't make his grades, and the second guy blew out a knee, and that gave me an opening, 'cause I had good grades and two good knees." David Housel, AU's athletic director and then sports information director, recalls Auburn's recruitment of James. "The coaches at that time obviously saw something in him that was greater, that was more important than his physical size. They saw something inside, in his heart, that made him special. Coach Jordan used to say that if he could look into the heart, mind and soul of anybody, he could make them into an athlete. I think Lionel James is the kind of player he had in mind when he said that." James' freshman year, 1980, was a tumultuous one for Auburn football. Great things were expected of Doug Barfield's fifth team. The 1979 squad had gone 8-3, and Brooks, a senior, was considered a major Heisman Trophy candidate. But the Tigers were crushed 42-0 at home by Tennessee in the third game and never recovered, limping to a 5-6 finish. Auburn failed to win an SEC game. For the 18-year-old James, the majority of the season was spent on the scout and junior varsity teams, "just trying to survive," as teammate Randy Campbell put it. Campbell, who came to Auburn in 1979 and was redshirted in '80, recalls his first impression of James. The 5-10, 168-pound Campbell says, "I guess a lot of people laughed at me when I showed up down there, and I know they laughed at him." Campbell chuckles when comparing his own stature to James'. "We were the two shrimps on the team," he says. "I could have been the famous one, but Lionel was even shorter than me." In a tale known to Auburn people far and wide, James' 5-6, 150-pound frame was not large enough to permit two numbers on his jersey, and so he was given number 6. He only carried the ball twice for the varsity in 1980, gaining five yards. James, as with many former high schools stars, was frustrated by his lack of playing time as a freshman. A few games into the season, he seriously considered giving up football, leaving Auburn, and transferring to another school to play basketball. Doug Barfield and Alex Gibbs helped the young James get his mind straight about college, and about his future. "(Gibbs) talked to me in a way that made a lot of sense," James says. "He told me to settle down, that I was away from home and not used to being away from home. He told me to work and things would come to me. It changed my life." Of Barfield, James says, "I went to his office, and told him I wanted to quit. He sat me down, and pointed at a picture of a duck on his wall. 'What do you see there?' he asked me. I was mad and depressed, and I just said, 'A duck.' Coach Barfield said, 'Look again. It looks all cool and calm on the outside, just sitting on the water. What you don't see is that it's paddling like hell underneath. That's what you have to do. You have to stay cool on the outside and keep working hard, and the good things are going to happen.'" At the end of the season, Doug Barfield was ushered out of town. On January 2, 1981, the Pat Dye era, and Lionel James' days as an Auburn football legend, began. "As a player," James says, "you come to know what to expect from the coaches during the season. When everything changed, and Coach Dye was coming on, we all wanted to know, what was this guy going to be like? How tough was he going to be? Now, the player grapevine got that word really fast that this guy was as tough as they come. The Internet isn't half as fast as that grapevine is." James was the first player Dye pointed out at his very first meeting with the team. "I joke about it with him now," James says, but he was hardly in a laughing mood at the time. James recalls, "All the juniors and seniors took all the seats in the meeting room, and I was just a freshman, so I sat on the floor. Coach Dye came in, and he kicked my foot as he was walking by. He stopped and told me to stand up. He asked me what my name was, and how tall and heavy I was. When I told him, Coach Dye said, "Five foot, six and 150 pounds. That's what's wrong with this team. We can't win with people like you.'" James would soon have his chance to make a better impression. The 1981 spring practice sessions are Auburn legends in their own right. Dye and his staff hit the Plains running, determined to start their tenure at Auburn with the toughest players they could find. Under assistant coach Bud Casey (whom James calls "the craziest coach in practice I've ever seen"), the running backs began to learn the wishbone. "I really had an advantage over the other guys," James says, "because we ran the veer at Albany, and that's just the wishbone without a fullback. So I already knew how to block. Guys like George Peoples and Sam Dejarnette had always been I-formation backs, and they had a hard time getting used to the wishbone." The hard work paid off. James was named the "Most Improved Running Back" on A-Day. By the time the season started, James had gone from an unknown underclassman to a starter. "Right now, Lionel James is the best all-around (running back) we have," Dye said at the time, "and he only weighs about 150." In the 24-16 opening win over TCU, James gained 65 yards on 11 carries, including a run of 34 yards. ACC weak sister Wake Forest took advantage of problems in the Auburn secondary the following week, topping the Tigers late by the score of 24-21. James managed 42 yards on seven carries in the losing effort. "The team was still in transition," James says of the opening games. "We didn't know how to win yet, and we really didn't believe in ourselves yet, but it was changing. We were starting to turn that corner and not accept being mediocre." For Auburn fans, the most memorable thing about the 1981 Auburn-Tennessee game is probably a scene from the aftermath, played over and over again on the highlight films from that era. The Tigers had lost the game, 10-7, after shutting out the Vols in the second half and fighting their way the length of the field. The last-chance 77-yard drive died three scant yards shy of the Tennessee end zone when the Neyland Stadium clock ran out. Pat Dye's stirring post-game speech to his troops, including a visibly disconsolate James, became a fixture of Auburn television for years to come. "I've never been as angry in my life as I was after that game," James says. "It was the biggest game I'd ever played in, and we fell short, and we all knew we should have beaten them." Auburn acquitted itself well on the road against perennial powerhouse Nebraska, losing 17-3 in a game that was far closer than the score. The Tigers fumbled twice inside the ten yard line, leading to both of Nebraska's touchdowns. One of those fumbles came on a pitch-out to James from inside the end zone. He beat the man on the corner, but had the ball batted out of his hands at the five. He struggled against the powerful Husker defense (as did all of Auburn's runners; gaining only 150 total yards for the day), going only 19 yards in four carries. The Tigers' relative success came as a surprise to the perpetually sold-out Nebraska crowd. "We were just 'Auburn who?' to them," James recalls "They were used to running up 70 points on nobodies-and at that time, Auburn was nobody. Those 75,000 fans were really shocked. I still think we should have won that one, too." The Tigers finally bounced back with a 19-7 home win over LSU, which featured four different Auburn quarterbacks and a team-leading 77-yard rushing day for the "Little Train." Auburn made it two in a row by smothering Bill Curry's Georgia Tech team 31-7. This was a special game for James, coming against one of the two teams he'd grown up watching from Albany. He led the team again with 94 yards rushing, and recorded his first pass reception as a Tiger. "I've got to be proud of...Lionel, that big stallion running back," Dye said afterwards. "Tech was always really special for me. A lot of guys from my area played there, and I wanted bragging rights. You didn't have to get me motivated to play Tech or Georgia." The Tigers fell back below .500 against Mississippi State, a loss made doubly painful by a flubbed snap late in the game that put MSU in position to win, and the presence of now offensive coordinator Doug Barfield on the Bulldog sideline. James was contained, gaining only 31 yards, but he still led the team, tied with George Peoples, in rushing yardage for the game. "That was an important game," James recalls. "We had come a long way, and we really were starting to have some confidence, but we weren't doing the little things yet." The Tigers responded with an emotional home win over Florida, 14-12. The game ended when Brian Clark shanked a 40-yard field goal attempt with 1:11 left to play. James led all rushers with 57 yards in a contest that many point to as the beginning of the bitter modern AU-UF rivalry. A 20-0 homecoming win over North Texas State that even Pat Dye called "boring" closed the home season. James gained only 26 yards rushing, but added 19 more on two receptions. The wishbone ran well against fourth-ranked Georgia in Athens, with James accounting for 47 of the Tigers' 286 yards against the nation's number-two rushing defense. But no Tiger ran nearly as well as UGA sophomore Herschel Walker, who rumbled for 165 yards en route to a 24-13 Georgia win and the Dawgs' second consecutive Sugar Bowl berth. "We went into that game really confident," James says. "A lot of people said we didn't have a chance to win, but we knew we had a good team. Coach Dye would say things before the game like, 'What are you going to do if we have a seven-point lead in the fourth quarter? What are you going to do if we're 14 points behind? You have to have a plan.' We hadn't really thought like that before." Auburn fell to 5-5 for the year, and would face not only their most hated foes, but also a brush with history in the season's closer. The final result of Paul Bryant's pursuit of Amos Alonzo Stagg is well known, a 28-17 Alabama win to give the elder coach his 315th career victory. Far more rarely recounted in today's descriptions of that contest is the phenomenal performance of the Tigers. In a game predicted far and wide as an Alabama blowout, Auburn statistically topped the fourth-ranked Tide, gaining 311 yards to Bama's 279. In the first half, AU outgained UA 200-88. But Auburn failed to score on four trips inside the Bama ten-yard line, including three missed field goals from future NFL veteran Al Del Greco, which, along with untimely penalties, cost the Tigers the game. George Peoples ran up a phenomenal 155 yards against the tough Tide defense. James ran for only 30 yards, but led the way for Peoples' heroics with outstanding blocking. James' first touchdown as a Tiger came that day, a one-yard scamper to tie the game at 14 late in the third quarter. He would finish the year as AU's leading rusher with 561 yards on 111 carries. "Alabama had a great team," James says, "and they didn't make mistakes. They didn't make penalties, and they didn't give up too many big plays. We did, and it cost us the game. I'll never forget what Coach Dye said in the locker room when it was over. He said, 'That team will never beat us again. We're going to go back and work, and recruit and bring in some help. Next year we will beat that team.' I was excited by that. I knew we were going to have a lot more depth, and I figured, I was a starter and I'd get to run the ball a lot more. I was thinking, 'I'll get 200 yards in this game next year; I'll have a huge year.'" James stops and laughs. "And what does Coach Dye do? He goes out and recruits Bo Jackson!" Auburn entered 1982 a year bigger and better. James, now "bulked up" to 170 pounds, was firmly ensconced as a starter at left halfback, and would share the backfield (as well as his dorm room) with the most famous runner in Auburn history, Vincent "Bo" Jackson. With Randy Campbell, Jackson and James formed the nucleus of one of the finest wishbones of all time. Now a junior, James was called on to be a team leader, and he did not shirk the responsibility. Everyone who was there recalls James as one who led by example. Housel says, "All you had to do was talk to him to see his outstanding depth of character and pride. He was a real mentor to the younger players." Campbell recalls James' reaction to the supremely-talented freshman Jackson. "Lionel really took Bo under his wing. I think he had more influence over Bo than any other player. Bo and all his talent didn't intimidate Lionel at all. He wasn't afraid to tell Bo when he did something wrong, and Bo really respected that. Lionel was a real practice player, and he inspired everybody to work harder through his example in practice. He was a starter and a big star, and he was out there working like he was a walk-on trying to make the team. "People are always coming up to me and saying, 'Bo didn't really practice much, did he?' I always tell 'em, when I was there, Bo was at every practice, and he gave 100 percent, and that was absolutely due to Lionel's influence." James, who is recruiting coordinator at Auburn, recalls Jackson as a singular physical presence. "You can tell a lot from body structure. There are a lot of guys who are great in high school, but just don't fit that mold of greatness. Bo, and Herschel Walker, too, were built like Michelangelo's David, physically perfect. And it wasn't just physical. You know from the first day of practice, who's going to be scared and who's going to take charge. Bo took charge. He did it from day one." The Tigers opened 1982 with a rematch against Wake Forest, and this time it wasn't even close. Auburn ran up 508 yards of offense on the way to a 28-10 victory. Early in the game, James broke free for a 67-yard TD run. He eventually gained 118 yards on 10 carries, and with Jackson's 123 yards, inaugurated a one-two wishbone punch that would power the Tiger offense for two seasons. Auburn barely got by Southern Miss the following week, 21-19, when the Eagles couldn't stop the clock for a field goal attempt. Auburn had failed to beat Tennessee for four years and pointed toward the Vols. The Tigers led only 17-14 going into the fourth quarter. The crucial play came during a late 80-yard drive that found James registering numbers in a most unusual category. He took a pitch-back from Campbell, then stopped and threw a long halfback pass to Jackson for an electrifying 43-yard gain. That set up a clinching Jackson touchdown, and the Vols went home 24-14 losers. James led Auburn with 129 yards on the ground and 43 through the air. The win put Auburn at 20th in the AP rankings, the first listing since 1978. "That play meant a lot to me," James says of the long pass. "It was a sign to me that I could really do a lot of different things on the football field." If the convincing win over Tennessee showed how far Auburn had come since 1980, the following week illustrated just how far the Tigers still had to go. Nebraska, armed with running back Mike Rozier, rolled into Jordan-Hare Stadium and all over Auburn. In a game not dissimilar from last season's Husker humbling of Florida, the Big Red swamped the outmanned and demoralized Tigers, 41-7. The powerful defense shut down the AU wishbone, holding the Tigers to 171 yards on the ground and 116 through the air. "We just got physically manhandled," James remembers. He managed more real estate rushing than any other Tiger, with 69 yards that included a 31-yard scamper, but he went out in the second quarter with a badly bruised shoulder. Auburn was trailing only 14-7 at that time. Then assistant Jack Crowe said in the aftermath that the loss of James was crucial. "Lionel means more to our offense than most people think," Crowe said. "He's a leader, and I think if you ask Randy and Bo, they'll tell you just how much Lionel James means to them when he's in the backfield. Bo's much more effective when Lionel's out there, and Randy feels a little more confident in the huddle than when he looks up and sees two freshmen (Jackson and Tim Jessie) at the halfbacks. There's probably a little hesitation in his mind when he gets to the line, which wouldn't be there when he knows Lionel is back there blocking for Bo or anybody else." Auburn continued to struggle offensively against Jerry Claiborne's Kentucky Wildcats, not making a single trip to the UK end zone. Del Greco provided all of Auburn's scoring with an NCAA record-tying six field goals. It was enough to top the decidedly inferior UK offense, 18-3. James, still slightly injured, carried only three times for 10 yards. The Little Train came back strong, having a spectacular day against Georgia Tech in Atlanta. Auburn demolished the Yellow Jackets 24-0, and James led the way with 187 yards combined offense, including four spectacular punt returns totalling 104 yards. James had an even bigger day in Starkville, leading the Tigers with 138 yards and a touchdown. Jackson, held out of the Tech game with a nagging injury, and playing only sparingly against Mississippi State, helped spark a sluggish offense in the third quarter. Bo ran for 59 yards and a TD behind James' inspired blocking, and cleared the path himself for Lionel to score and put the game away in the final period. The final score was 35-17. The headlines all read, "Bo leads Auburn to victory"-but it was James who again led the team in yardage. "I'm used to it," James said at the time. "It doesn't bother me. I have my role, and Bo has his. I just want to help us win." James found himself at the bottom of a pile and the center of a controversial finish the following week in Gainesville. Auburn had led Charlie Pell's Gators 17-13 in the fourth quarter until Florida drove for a field goal to cut the lead to 17-16 with 2:37 left to play. Florida lined up for an on-sides kick. Jim Gainey's kick bounced high into the air at midfield, then came down into the hands of James. But James could not control the ball, and knocked it to the artificial turf. He fell on the ball, getting an arm around it just as the Gators crashed into him. It came down to an official's decision-did James have possession, or Florida's Leon Pennington? "I had the ball," James says. "In Auburn, that call would have gone our way. In Florida, it didn't." Florida was awarded the ball, and the Gators drove to a game-winning field goal on the final play. James was played sparingly as Auburn got back in the win column with a 30-7 homecoming thrashing of Rutgers. Then, Georgia, the two-time defending SEC champs and ranked first in the nation, came to Auburn. The 1982 Tigers vs. Herschel Walker and the Bulldogs battle was predicted far and wide as a blowout, but somebody forgot to tell Auburn. Campbell ran the offense brilliantly, scoring on an impossible keeper to put AU ahead 7-3 in the first half. Georgia responded with a 47-yard Walker run, and followed it up with a field goal from the great Kevin Butler to lead 13-7 at the half. The defenses kept both sides scoreless in the third period. Just into the fourth quarter, the Tigers were backed up on their own 13-yard line. Campbell tossed back to James, who dodged a hulking Dawg, turned on the speed, and was gone for an electrifying 87-yard touchdown, the second longest in Auburn history. The Tigers led the top-ranked Bulldogs 14-13. Georgia came back with a powerful 80-yard drive, led by Walker, and held off a furious late Auburn drive to win 19-14. History has largely forgotten that Auburn outgained the Dawgs 350-288 yards, and held the ball nine minutes longer than Georgia. What history has not forgotten was the reaction of the Auburn fans to that heartbreaking loss. After the game ended, Dye tried to console his despondent team in the dressing room. By his own admission, he didn't have any words to soothe the hurt. Outside, in the stands of Jordan-Hare Stadium, the Auburn people stepped in for the coach. As Dye struggled, their roar came through, loud and clear for 20 minutes after the final whistle. "It's great to be an Auburn Tiger! It's great to be an Auburn Tiger!" "That was amazing," James says. "It was so important for us as a team to develop confidence, and that confidence had grown so much that it affected the fans, too. We didn't have to have guys standing up on the bench, trying to get the fans up-they were right there in the game with us. We went from having maybe ten, fifteen thousand people in the stands during warm-ups to sixty or seventy thousand, and that really pumps you up, to see the fans there that early." On November 27, 1982, Auburn beat Alabama 23-22 in Legion Field, breaking a nine-year drought and ending Paul Bryant's SEC career with a loss. The hero for Auburn was Bo Jackson. Of course, there's more to the story than that. While "Bo Over The Top" are the first words that come to mind when recalling that legendary day, Jackson would be the first to tell you he didn't do it alone. Early in the game, Auburn was on the verge of going three downs and out from the Tide 14. Two plays had failed to gain after Tim Drinkard had carried an Alabama fumble 62 yards before being dragged down. On third and ten, James took a handoff in the backfield, ran right, and dodged most of the defense on his way toward the end zone. He even managed to push past All-American Jeremiah Castille at the goal line to tie the game at seven. James would run for 62 yards and helped Auburn get back into the game after a disastrous third quarter when he nailed a corner block to free Jackson for a 53-yard dash. "I think of that as an eight-quarter game," James says, referring to the Alabama games of 1981 and '82. "In '81, the Alabama players had a solid confidence in their eyes, they knew they were going to win. In '82, I remember looking at the same guys and seeing pure panic. We were the confident ones, we knew we were going to win that thing, no matter what." In the aftermath of 23-22, Dye invited the Auburn players to return to the field and "thank our people." Few who have seen the replays, and no one who was there, can forget the sight of James, lifted off his feet and passed above the heads of the Auburn faithful in that momentous celebration. "I walked out onto the field," he recalls, "and saw all these guys hanging from the goal posts, and thought, 'this place is a zoo.' Then, a guy in the tunnel picks me up and lifts me off the ground. The next thing I know, he's passing me up into the bleachers, and I didn't touch the ground again for half an hour." James and the Tigers travelled to Orlando to play in the Tangerine Bowl, Auburn's first post-season appearance since thrashing Texas in the 1974 Gator Bowl. James had an outstanding game, leading the Tigers with 101 yards as Auburn topped a Doug Flutie-led Boston College team, 33-26. James considered it a more significant game than the Sugar Bowl the following year. "It was the most fun and the most exciting, because we were getting that real feeling of success, finally getting what we'd worked for in all those two-a-days and practices, finally getting that reward. If we'd played for the national championship, it wouldn't have been any bigger for us, because that game meant we'd turned the corner." While freshman sensation Jackson got the headlines as the breakthrough player for the Tigers, it was the "Little Train" who was awarded Auburn's Pat Sullivan Award as the season's outstanding offensive player, gaining 793 yards on 113 carries with seven TDs. He added 56 yards receiving with 15 catches, 467 yards on 30 kick returns, and even 43 yards passing on a single throw from the Tennessee win. "We were a real unselfish group," James says when asked if he was bothered by his lack of press coverage compared to Jackson. "We never talked about who was getting the ball, or who was getting the yards, or whatever. Now, we did talk about knockdowns. Everybody in the backfield, we would argue about who got the most knockdown blocks, all the time." His senior year, James found himself at the heart of one of the greatest teams in Southeastern Conference history. He, and Auburn, had come a long way since 1980. The Tigers, despite facing the toughest schedule in the nation, were consensus picks to take Georgia's place at the head of the conference, in a year when any of four or five SEC teams could have contended for the national championship. "Everybody was pretty much coming back," he says. "We knew we had crossed the line and become a really good team. We had an outstanding defense, and we felt like we could beat anybody we played." Optimism was running high until tragedy struck. Senior fullback Greg Pratt died in practice, the victim of heatstroke during conditioning drills. The team was shocked to its core by the loss, none more than James. Pratt was also from Albany and had transferred to Auburn on James' advice. The two often shared James' older brother Tim's car for trips home. Tim played basketball for Auburn Coach Sonny Smith. "It was uncharacteristic of Greg to be in the front of his group during those drills," James remembers, "but he was out in front on the first lap. Then he started to lag behind, and by the time it was over, the other guys were carrying him across the finish line. He made it into the dressing room, and I found him laying on the floor of the shower, praying to himself, the Lord's Prayer and the 23rd Psalm. I went over and helped him out of the shower, and he said, 'Tell Mama I'll be all right.' I thought he was okay, and Bo and I went to eat lunch. When we came back, everybody was down on the floor, praying, and Kyle Collins said to me, 'I don't think Greg's going to make it.' I couldn't believe it. I didn't think 21-year-old athletes could die." After a long, painful summer practice, the season mercifully started. Against Southern Miss, it was James who opened the scoring for Auburn. He had his biggest day yet as a Tiger, with 172 yards, leading Auburn to a 24-3 win. His total included an 84-yard streak that would have been a 94-yard touchdown, the longest in Auburn history, had freshman Tommie Agee not been called for a clip downfield. The Tigers stumbled only once that year, at home against the best team Texas had fielded in the last 13 seasons. For whatever reason, Auburn was not ready to play when the Longhorns came to town, and lost 20-7 in a game with few Tiger highlights. "We didn't play like we were capable of playing," James says, "and Texas did everything right. Everything that could go right for them did. Everything that could go wrong for us, went wrong." James and his teammates hunkered down, weathering a brutal storm of media criticism. Auburn went into Neyland Stadium to face a strong Tennessee team, one that would lose only two games in 1983. The first half was close. With the score 7-7, Campbell began going to the air with a devastatingly accurate series of out-routes, finishing with a great catch from James. That set up a field goal, and a 10-7 halftime lead. The Tigers came alive in the second half, with Campbell, Jackson and James abusing the Tennessee defense for 300 yards rushing and several clutch pass receptions. When it was over, the Tigers walked away with a rare big win in Knoxville, 37-14, and more importantly, they stood tall with renewed confidence. The most overlooked game of the 1983 season was, oddly enough, probably the most exciting. Florida State in years past had been an Auburn punching bag, a perennial Homecoming opponent. But by '83 Bobby Bowden had built the Seminoles into a power, and they gave one of Auburn's greatest teams all it wanted. With 6:35 left to play, FSU took a 23-20 lead, and the Tigers were forced to march the length of the field. It was a drive that featured what Campbell considers to be James' most memorable play. Campbell had already been forced to throw on fourth down once in the drive, a completion to Ed West to move the chains. With time running down, the Tigers found themselves with fourth down again, this time from the Seminole 15. Running from a broken-wishbone formation that confused the FSU secondary, James ran wide open into the flats. James, slightly injured, pulled in Campbell's pass and dashed to the flag, scoring by inches. Auburn won, 27-23. Kentucky was demolished in Lexington, 49-21, and James led the way with great blocking for Jackson. The Tigers came out flat against a bad Georgia Tech team, falling behind 10-7 at the half. In the dressing room, Dye laid into the team. "Coach Dye dropped the bomb," James says, "on everybody in there. He started with us, the starters, and went right on down the line. He said, 'What is this All-America stuff, who are you guys?' He said a lot of things I can't repeat." The rebuke took hold, and Auburn roared back in the second half, handing Bill Curry yet another loss, 31-13. Against Mississippi State, James literally led the way. On Auburn's first play from scrimmage, he raced around right end 74 yards for a touchdown. The final score, 28-13, was quickly forgotten as the Tigers geared up for a game they had pointed to all year. The Auburn-Florida game of 1983 was perhaps the greatest collection of talent in a single contest in SEC history. It was a big, emotional game between two Top 10 teams, and Auburn rose to the occasion. James smacked down a defender in the backfield to free Jackson for a 55-yard TD on the opening drive, then stopped a defensive end to get Campbell in the end zone. James got the call himself in the second half, dodging through the defense for a 16-yard TD to put Auburn up 21-7 at the half. After a controversial (to Charley Pell) turnover in the Tiger end zone, Jackson put the game away with an 80-yard touchdown on the very next play. The Auburn defense put down a furious Gator comeback attempt, and the Tigers took the day, 28-21. "Bo was sick that day," James remembers, "and I fractured one of my fingers when a chair I was sitting in collapsed on me right before the game. I was supposed to return punts, so I couldn't get the hand deadened, and I was in a lot of pain. We were shook up, because there we were, the two starters, and both of us had something bad happen right before the game. But Bo just shook it off and took over. He took his game to another level that day. I told him, 'Man, you need to get sick more often.'" The murderer's row of 1983 did not allow Auburn a Homecoming break. Maryland, led by Boomer Esiason, was another Top 10 squad. The wishbone ravaged the Terrapin defense. James ran for 105 yards, Jackson for 115 and freshman Agee had a career-high 219 yards plus two touchdowns. Despite Esiason's passing heroics, the Tigers triumphed 35-23, and James walked out of Jordan-Hare Stadium, in uniform for the last time, a winner. "They tried to take out the outside game," James says, "and that just opened it up for Tommie to run wild up the middle. In the second half, they started defending the middle, and me and Bo got our chance to run outside. That was a real special game. When it's your last one at home, you want to stretch it all out, make it last as long as you can." As fate would have it, James and Auburn would have to go to Athens and take the SEC crown away from Georgia. With Walker gone to the pros, the Tigers relied on defense to win the championship. After forcing a fumble and getting a tough run from Jackson, Auburn found itself on the Bulldog three-yard line. This time, it was Bo's turn to make the crucial block, crushing a defender on the corner, allowing the "Little Train" to chug untouched into the end zone for Auburn's only touchdown. Two Del Greco field goals were eventually tacked on, and the defense held off a wild Georgia comeback attempt. The final score read Auburn 13, Georgia 7, and the Tigers had gone from worst to first in the nation's toughest conference in four short years, the span of Lionel James' Auburn career. Of course, there was this formality of beating Bama before Auburn could claim the title outright. That rendition of the Iron Bowl, Ray Perkins' first as the "heir to the Bear," will always be remembered as "The Bo Show" or the "rain game." Jackson, assisted again by the inspired blocking of Little Train, had a career day with 256 yards and two touchdowns. The second Jackson score, a monster 74-yard classic, put AU up 23-20 late in the third quarter, and then the bottom fell out over Legion Field. Fifteen wet, sloppy, scoreless minutes and a tornado warning later, Auburn's conference triumph was complete. James finished the regular season as the Tigers' second-leading rusher behind Jackson with 728 yards and four touchdowns. "It was like the Twilight Zone in that rain," James says. "All that was missing was Rod Serling's voice. It was like time stopped everywhere but on the field. We couldn't see the crowd, all we could see was rain and lightning flashes. It was eerie." Returning to the Sugar Bowl for the first time since 1971, Auburn faced a tough Michigan team coached by "the other Bo," Wolverine legend Schembechler. The Michigan defense was extremely tough, keeping Auburn out of the end zone for the duration. In the end, it came down to the foot of Del Greco to win it, 9-7, but before that final kick could be teed up, it was left to James and his wishbone partners to force the ball the length of the field and into position. They did not disappoint, and Auburn finished the season 11-1. It should have been enough for the mythical national championship, but the Tigers were passed over by the sportswriters in favor of what many called an inferior Miami team. Jackson was named the Sugar Bowl MVP, but the superstar refused the honor. Instead, Bo handed the trophy over to his friend and mentor, Lionel James. Jackson's magnanimous tribute was not the last for the "Little Train." He was presented the Shug Jordan Award as the outstanding senior player. In 1987, Dye recognized James' Auburn legacy by inaugurating the Lionel James Offensive MVP award for each year's A-Day game, in honor of one of his favorite players. After the bowl, James and Jackson went back to the hotel with their teammates to rest up and change. "We were all beat up from that Astroturf," he remembers, "and we just wanted to get upstairs and lie down for a while. So, me and Bo and Coach Dye and Coach Casey and David Housel all piled into this freight elevator in the back of the hotel, figuring we'd miss the crowd in the lobby. That elevator got stuck between floors, and we were trapped there for an hour. Those were some big guys in there, and it got real, real hot." James was not satisfied with a single season of glory for Auburn. "I've enjoyed playing here the last four years," he said at the time. "If I had another four years to spend here, I would ... I believe Auburn is going to be the next team of the decade." Once again, James was on target. Auburn would go on to dominate the conference for the remainder of the '80s, claiming three more championships, and was proclaimed "Team of the Decade" at the end of 1989, thanks in no small part to the foundation James and his teammates had helped to build. James was drafted in 1984 by the NFL's San Diego Chargers in the fifth round. It was something of a surprising choice, even given James' outstanding college career. Most observers figured him for a kick return specialist, who simply wouldn't be able to compete in the pros at running back. James was surprised himself, already having accepted a regular job in south Georgia. He packed his bags and headed west. "Going to California was like going to Mars," James says. "I was a country boy who always wanted to live in the city, but it was a total shock. The first day I was out there, somebody shot 21 people in a McDonald's. I enjoyed it, I really liked San Diego, but that isn't the kind of place where you want to raise a family." In his rookie season, James posted 529 combined yards as a Charger, including 206 yards on 23 pass completions. "Coach (Don) Coryell's offensive system was really different from what I was used to," he says. "There was a lot more passing, a lot more draws and sweeps, and I started doing a lot of new things. I almost stopped blocking completely." It was a fine record for any newcomer to the NFL, especially a 5-6 newcomer, but James was only getting started. In 1985, James set an NFL record in combined yardage that stands to this day, totalling 1,756 in 16 games. James led the Chargers in receiving with 1,027 yards on 86 catches and in rushing with 516 yards on 105 carries. He scored eight touchdowns. He was named the Chargers' Most Valuable Player for the 1985 season. "You have to remember, we had great talent on that team: Dan Fouts, Charlie Joiner, Kellen Winslow, guys like that. The defenses would key on those guys, and it opened up opportunities for me. A lot of those big plays started out going to somebody else. The dice just rolled my way." The Chargers fell on hard times in 1986, with Coryell being fired after dropping seven of the first eight games. His replacement, Al Saunders, won only three more. James had a solid year with 491 combined yards, but was unable to build on his outstanding 1985 effort. He bounced back in 1987, rolling up 593 yards on 41 completions, 102 yards on 27 carries and 400 yards on 32 kick returns. He was the Chargers' leading scorer, helping the team to improve to an 8-7 record. In 1988, James turned in another strong performance, gaining 662 combined yards. James set seven Chargers and one NFL record during his pro career, recording 209 receptions for 2,278 yards, 99 kickoff returns for 2,094 yards, 124 punt returns for 1,193 yards and 1,062 yards on 231 rushing attempts. James, like fellow Auburn legend Jackson, was forced to leave football due to a degenerative hip injury. "It's called avescular neurosis," James says, "and it basically means I have an arthritic hip. Part of the hip has died because it isn't getting enough blood. They told me, 'You can go on playing, but you may end up in a wheelchair.' That was an easy decision for me. I wanted to be able to walk the rest of my life." Unlike Jackson, James had not undergone hip replacement surgery. "It can wait," he says. "As long as I can walk without pain, I'm going to wait to get it done." With the NFL behind him, James returned to Auburn to finish his degree in math education. "I spent most of my time in Parker Hall," he remembers. "I spent a lot of time with the football team, too. It was the best way to stay in shape, working out and running with those guys." James put his degree to work as a math teacher at a middle school in Terrell County, Ga. At first, he tried to put his past behind him. "I was really burned out on football, and I just wanted to get away from the game," he remembers. "But after a while, I found out that I was missing football more and more." He returned to the field in 1993, this time as an assistant coach at Terrell. 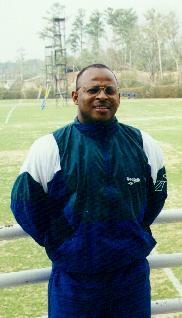 In 1994, James moved to Woodlawn High School in Birmingham, continuing to teach in the classroom and coach on the field. The following year, James' rapid ascent up the coaching ladder led him to Division I-AA Appalachian State in Boone, N.C. Auburn All-American Stacey Searels was an assistant for the Mountaineers, and when the tight ends coaching slot opened up, he called James and arranged for an interview. Appalachian State recorded a 12-1 record that season. In early 1996, a shake-up on the Auburn coaching staff left Terry Bowden looking for replacements for recruiting coordinator/tight ends coach Rodney Garner and defensive line coach Kurt Crain. Bowden, who knows a few things about little big men, was looking for an impressive young coach with Auburn ties, and he found James at Appalachian State. "After checking around," Bowden said, "I found that he has made an immediate impact every place he has been." Bowden offered James a position as tight ends coach, which the "Little Train" was happy to accept. "I was all ready to go to work at the University of Pittsburgh, for Johnny Majors, when the call came from Coach Bowden. As soon as I heard I had the chance to come back to Auburn, I said, 'That's a done deal. I'll be there as soon as I can get a ticket.'" James has also assumed the duties of recruiting coordinator for Auburn. "You can't believe how excited I am to bring in a guy with the reputation and character that Lionel has," Bowden says. "Lionel has little coaching experience, but he is proving to be an excellent on-the-field coach." That's hardly surprising, given James' reputation as a "practice player" from his college and pro careers. As for the future, when asked if he wants to be a head coach himself one day, James answers in the affirmative. "That's an ambition that's out there," he says, "but it's a long ways off. Lou Holtz says that an assistant who doesn't want to be a head coach is not serious about coaching. I'm very serious, but I have a whole lot to learn, and I really don't have a lot of coaching experience yet. It doesn't come overnight, but I couldn't have a better teacher or model to follow than Coach Bowden. Right now, I'm right where I want to be."